Just a quick update on the MX5. The GSXR 600 throttles have been assembled and attached and are now on their way to running pretty nicely. The physical side of the install was pretty simple, mostly a case of bolting stuff up. The only real issue I faced was the routing and length of the throttle cable, which took a few attempts to get right. After a lot of trial and error and the use of some mountain bike parts to help the cable get round some tight bends, the cable now fits fine. The ratio of throttle plate movement for a given amount of cable pull is now a little higher that it was before, making the throttles very sensitive to small pedal movements. This can currently make the car a little difficult to drive smoothly in traffic and when parking. I have a plan to move the cable mounting point on the pedal to resolve this, but it’s not an urgent modification. On the ECU side of things, the car is tuned and running well under most conditions. Startup and idle are smooth (the car sailed through its MOT last month) as is 90% of driving whilst the car is moving. Increasing the revs off idle is still a little rough, things go lean for a split second and stumble, which again makes driving the car in traffic a little laborious. Once moving, the fuelling is smooth and wide open throttle sounds great. There are a few things that I rushed to get the car ready for the summer which I’d like to go back and revisit. For now I’ll just enjoy the sunshine though, when autumn starts to arrive I may take it all apart again and make a few small improvements. Amongst other things I think the head would benefit from a small skim. We’ll see. 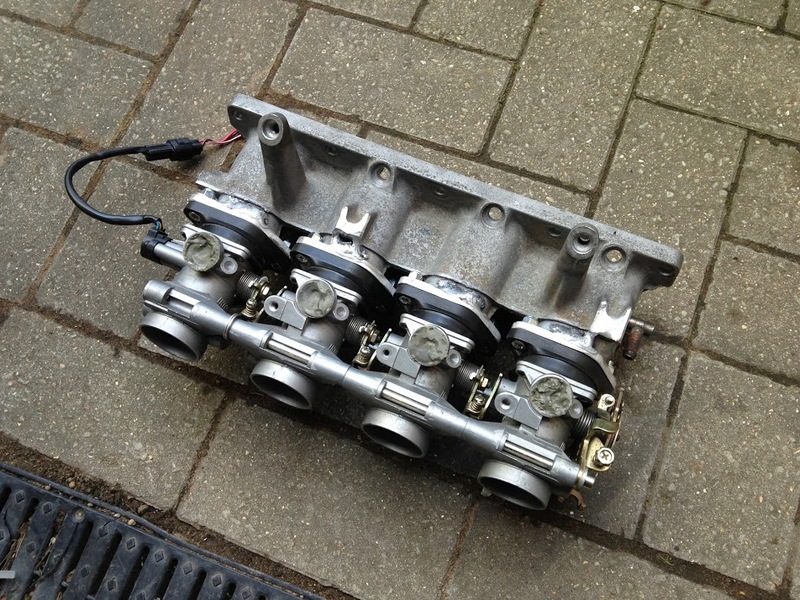 Over the last couple of weeks I’ve been taking lots of the MX5’s engine compartment to bits in order to fit a set of individual throttle bodies from a Suzuki GSXR 600. Over the winter, while the car was in the garage, I’ve been collecting parts here and there for the conversion whenever I see them come up cheaply on ebay. Now the weather has improved and the evenings are getting lighter, I’ve started putting it all together. To the right is a picture of most of what is going into the car. The manifold is an old MX5 inlet manifold that’s been cut down very short and had four small aluminium flanges cut out and welded on to mate up to the Suzuki throttle flanges. The throttles themselves have had the injector ports sealed up as I shall be using the original injector locations in the inlet manifold. 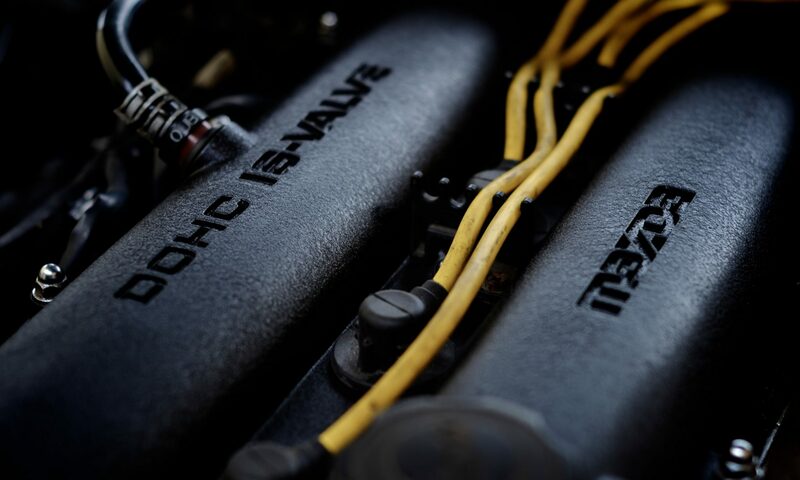 On the underneath of each throttle is a vacuum port which shall be connected to a common vacuum block to provide a vacuum feed to the ECU, brake servo and fuel pressure regulator. 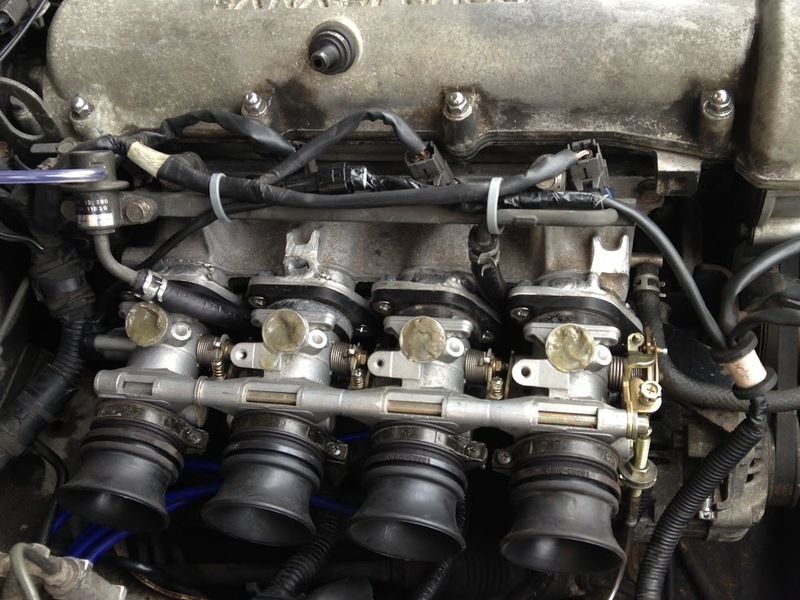 The standard MX5 throttle cable should attach easily to the whole assembly and the Suzuki throttle position sensor should connect into the MX5 loom with only a small amount of rewiring. Other than that, I’m hoping it’ll all be a fairly simple process. A while back I posted that I’d just picked up a new Eunos Roadster (MX5) and that photos would follow shortly. Well, over a year later, here are a few. I attended an MX5 trackday this weekend at Silverstone’s Stowe circuit. It was the first time the car has really been pushed hard since I’ve owned it and I’m pleased to report that it handled the day well. The Roadster is well suited to Stowe’s short straights and twisty nature. Handling was spot on – this car is so easy to steer on the throttle, even in the wet – and the car kept up with most stuff through the bends. The straights were a touch frustrating though, lots of cars in attendance were either bigger engined models or fitted with turbos or superchargers which left me pretty much bottom of the pile in terms of straight line speed. The car feels a little exposed on track in standard trim, a proper roll bar/harness bar and a decent seat with harnesses would be nice. More power would be great too but it would be difficult to justify the cost of a supercharger conversion when the car only cost £1000. Mazda On Track are running a day at Brands Hatch in December which I’d like to attend. I’ll have to see how money is looking in the run up to Christmas. I bought a new car from a friend a couple of weeks ago. I didn’t really need another car but it was a bargain and I couldn’t resist. It’s a 1990 Eunos Roadster (Jap import Mazda MX-5). Not sure if being 20 years old makes it a classic car or just old. It’s not perfect. One of the rear dampers feels like it’s knackered and a bit bouncy so left and right cornering isn’t entirely consistent when pushed hard, there are a few paint chips and scuffs here and there, the diff needs an oil change and the stereo speakers are ready for the dustbin. On the plus side though, it has extremely low mileage, a new hood, a brand new stainless steel exhaust, two sets of wheels, a sweet running little engine and has just sailed through an MOT with no problems at all. By my reckoning it should make for a very cheap little toy to stick in the garage and take for a drive on sunny days. Unlike my previous Roadster this one’s ‘just’ a 1.6. I say ‘just’, but the difference in power between this and the 1.8 is negligible and if anything I would say that the 1.6 is the revvier, more sporty engine. I think this one’s had an uprated flywheel too which feels great, especially on downshifts. Makes the VX220’s powerplant feel positively lazy. I’ve only had a chance to drive it properly a couple of times so far but I’m absolutely loving it. It’s not fast by any stretch of the imagination but the steering is quick and precise, the brakes feel great (especially after driving modern over assisted cars), the gearchange is sweet and the raspy little exhaust puts a grin on your face when buzzing about with the roof down. I think I’d forgotten what a pleasure driving could be. I need to take a can of anthracite/dark grey paint to the naff looking red wheel centres and get hold of some cheap door speakers so I can listen to the radio, but that’s about it. New shocks and bushes would be a luxury but they can wait till next summer. Pictures to follow soon no doubt.